Daniel Stephanus Botha was born on 28 February 1947 near De Doorns. He started to work at the Provincial Library in Cape Town, and studied Afrikaans and Nederlands at the University of Stellenbosch, where he obtained a BA in 1970. 1973: Diploma in Drama at the Academy of Drama. 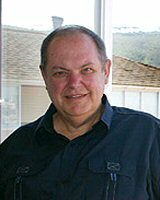 He worked as editor for fiction at Tafelberg publishers from 1972 until his retirement in 2000. Danie Botha is co-founder, chairman and actor of Die Akademiespelers and lives as a single in Cape Town.